The Earth may seem like a scary place right now, but imagine what it will look like in 800 years. That’s what Gabriel Hardman and Corinna Bechko do in the pages of Invisible Republic #11, kicking off a new arc of their hard sci-fi political thriller by visiting the dying planet that spawned the Sol Central Government. Climate change has devastated the environment and made Earth uninhabitable except for the Terra Stations full of people trying to re-terraform the planet, and reporter Croger Babb gets to see these dire circumstances up close when he goes to Earth on his Invisible Republic book tour. The novel that gives the comic its name reprints the journals of Maia Reveron, cousin of the late dictator Arthur McBride, and the small, isolated Earth population has deeply connected with the book’s story of a man who sparks a revolution to gain independence from an interplanetary governing body. The first 10 issues lay the groundwork for Maia’s past and present, and although Croger is the character that incites the action, Maia is the focus of the narrative. As Croger deals with the consequences of getting his hands on the journal in 2843, the story flashes back to detail Maia’s relationship with her cousin and the other revolutionaries who joined his cause 40 years earlier, giving readers a firsthand account of the history behind the tense, paranoid atmosphere that surrounds Croger. Present-day Maia introduced herself to Croger in the second story arc, and as the book continues, the writers draw a stronger contrast between the compassionate Maia of the past and the cold, calculating Maia of the present. That contrast between timelines is highlighted in the distinct visual elements of each. Jordan Boyd’s coloring for the present is so limited that it’s almost monochromatic, and the grayish-brown pallor reinforces the time period’s bleakness. There’s much more hope in Maia’s past experience, represented by a richer color palette. Panels and word balloons in the past have solid black borders, whereas there are none in the present, and removing that line between the gutter, the text, and the artwork adds an element of claustrophobia to Croger’s story as the white gutters push their way into the panels through Simon Bowland’s word balloons. Throughout the series there has been this general feeling that Croger is trapped, and this is the issue where he realizes that exposing Maia’s journals may have made his situation even worse. These dual timelines make for an especially dense plot, but the creative team keeps the pace moving rapidly in both narrative threads. There’s a lot to take in, but switching between the two threads limits how much time is spent in each period, presenting information in smaller chunks that are easier to digest. In terms of the overarching plotting, Hardman and Bechko make a very wise decision in pushing the timelines forward a few months at the start of this new arc, and readers are reorienting themselves in this world as Croger and Maia are orienting themselves to new settings in their respective periods. Despite being two separate arcs, the first 10 issues felt like one story that ended with Maia’s journals about to go public, but this week’s issue feels like the start of Invisible Republic season two. The characters are in different places, and new mysteries are introduced by how things have changed since readers last saw this world. Given Hardman’s extensive résumé as a storyboard artist, one might be inclined to describe his work as cinematic, and for a comic like his dog-napping thriller Kinski, the description fits. That was a story told with a rigid six-panel grid that read much like a series of storyboards that could easily be adapted for film at a fairly low budget, but Invisible Republic is far more ambitious in its use of the comic-book medium. Take the first page of issue #11’s Maia flashback: The scene opens with an establishing panel showing the huge rock formations overlooking the vast forest on the planet Asan, where Maia and Christoph have found refuge in the abandoned cottage owned by Christoph’s family. The cottage is situated in the top right corner of the page, with a three-panel sequence beneath it showing Christoph gathering rainwater on the cottage grounds. That establishing shot bends around the top left corner and travels down the side of the page next to the three panels, allowing Hardman to create a vaster image of the setting while also boxing those three panels underneath the cottage, subtly indicating to the reader where that action is occurring. 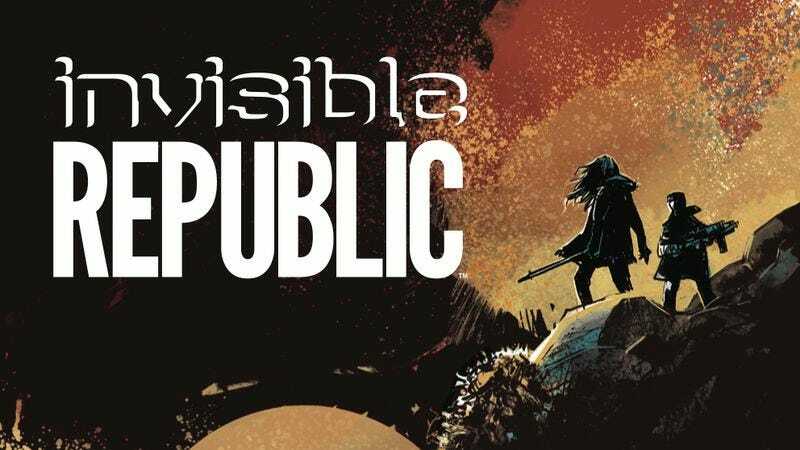 Like another hard sci-fi political thriller from Image Comics, Invisible Republic is especially chilling because it’s so plausible. The Earth of Image’s Lazarus could be a stepping-stone toward Invisible Republic if the two books weren’t completely separate properties, and the dissolution of countries in Lazarus and their replacement with a select few families could reasonably lead to the single unified governing body that dominates Invisible Republic. Hardman and Bechko’s story takes place much further in the future, allowing them to make bigger jumps in regards to technological advances and cultural shifts, but they never get too far-fetched. The back-matter essays by Bechko explore the real-world bases for ideas like creating gravity in space or using a space elevator to travel to and from a planet’s or moon’s surface from orbit, and this week’s issue has an essay about how Earth was basically terraformed by prehistoric cyanobacteria that contaminated the methane-heavy atmosphere and made it possible for larger living species to evolve. Considerable care has gone into building a believable sci-fi world in Invisible Republic, and while the back matter isn’t required reading to understand the story, pieces like an excerpt from a travel guide about the flora and fauna of Asan give readers a deeper understanding of the environment and how humans have come to interact with it over time. This attention to detail is what makes the main storyline so compelling, and even if readers weren’t shown the work that has gone into these auxiliary narrative elements, that work would still be the thing pulling them deeper and deeper into the story.